Thomas Williams was born 31/5/1737 at Llansadwrn in Anglesey to a minor land owning family. 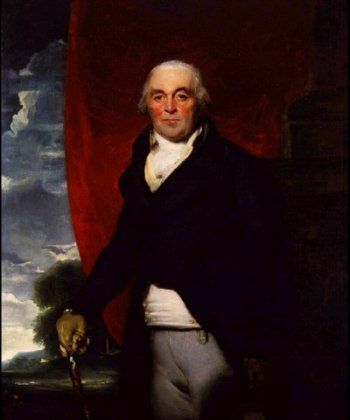 He became a lawyer and was first used by Edward Hughes in 1774 to try and untangle the legal disputes about the boundary of the Parys and Mona lands. Thomas Williams legal work led to the formation of the Parys Mine company in 1774. With Jonathan Roose as his technical expert. Over the next few years his influence and skills grew. He also formed alliances and eventually also gained control of the Mona mine. Between 1787 and 1792 his influence grew until he had complete control of the Anglesey and Cornwall copper mines. In 1778 a new company was also formed to extract brimstone from the ores on the mountainside. Thomas had copper warehouses in London, Birmingham and Liverpool. He erected smelting works in coal fields on South Wales and Lancaster. This was important as Anglesey coal was poor for smelting and each tonne of ore needed 3 tonnes of coal. He campaigned vigorously for the reduction in duty on coal carried by coast to try and improve the smelting and pumping costs at the mine. Copper works were built at Flint and Penclawdd to make copper and brass products. Many of these materials were for use in the African Slave trade. Thomas invested £70,000 in this trade and petitioned parliament in 1788 when a bill was being discussed to prevent British Ships carrying slaves. He also introduced the use of copper bolts to fix the copper sheeting to Naval vessels and seem to have sold then to all sides in the naval conflicts. Thomas Williams also introduced the Parys Mountain Copper coinage which was used to pay his workers. At Mona mine the old 21-year lease to Roe and co had expired in 1785 and a new company was formed. This was known as the “old” Mona Mine company and was still confined to the Cerrig y Bleddia area. Thomas William’s became a partner in this new company when Bayly sold his share to a London Banker. Under the Roe and co lease only the best parts of the mines had been worked. Towards the end of the lease the whole area had lacked investment and had poor facilities. Under Thomas Williams direction new buildings were built at Mona and a new quay built at Amlwch Port. Between 1785 and 1788 over £61,000 was invested in the Mona mine. This investment was well repaid over the next 10 year as new areas were opened and the Zenith of the combined mines production was reached. During these years 1200 people were employed at the two mines. Thomas William’s died in 1802 and over the next 5 years the production of copper at the mines dropped dramatically. By 1808 only 120 men were employed. The rapid drop in production was partially due to the end of the workable areas of the Open cast and partially because of a reduction in the market for copper.